Saturday, January 19, 5:30-6:30pm – Community Center – Another opportunity to browse the exhibits with some wine and light snacks before heading over to the South Bay Community Center in Los Osos for James Currie’s keynote presentation. Sponsored by Out of This World Discount, Optics Swarovski, Optik North America Ltd. & Opticron LLC. 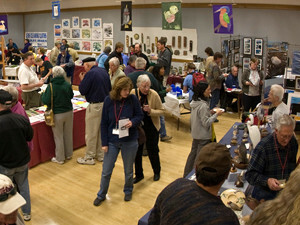 Enjoy wine and cheese and meet fellow birders in the Bird Festival Bazaar area. Browse through the vendor booths featuring binoculars and scopes, books and CDs, garden art, watercolors and nature photography, wood carvings, jewelry, clothing and more! James takes you on a fantastic video journey around the world to see some of the planet's most sought-after and bizarre bird species. From North and South America to Australia and Africa the diversity of our birdlife is astounding. See strange breeding behaviors, first-time footage of rare species and some humorous insights into the exciting world of wildlife videography. A life-long wildlife enthusiast and native of South Africa, James Currie works for Wilderness Safaris as their Brand Ambassador. James also hosts the popular birding TV show, Nikon’s Birding Adventures, now in its 9th season and currently airing on Discovery Channel’s Destination America. He hosted the popular action-birding show “Aerial Assassins” on National Geographic WILD, aired in the United States and worldwide in 2012 and appeared as himself in the reality birding show, “Twitchers” that aired on the National Geographic Channel in 2014. He has led professional wildlife and birding tours for 20 years and his passion for birding, adventure and remote cultures has taken him to nearly every corner of the globe. James has appeared as a special guest on various TV shows and radio, including Martha Stewart Radio, and WGN and has been the subject of several newspaper articles including the Wall Street Journal, The Palm Beach Post and the Orlando Sentinel. James filmed for, consulted for and provided footage for the 2011 Hollywood birding. This talk might as well be about aliens! A creature so foreign we have a hard time understanding. Imagine never touching land for 5 years, as some albatross do. Or think about flying thousands of feet up, crossing the oceans as you “surf” the pressure wave of a tropical storm as frigatebirds can do. How about to be able to identify your mate by the way they smell as many seabirds do? Because seabirds are out there in the ocean, and we are landlubbers, we do not get to experience the full breadth of amazing behavior that these birds do. They may indeed be the most interesting birds in the world. They also are diverse, from albatross and puffins, to storm-petrels and murrelets and shearwaters and penguins. This talk is an appreciation of seabirds, with a focus on California and what makes it one of the world’s seabird hotspots. This will be a fun exploration of our offshore environment, touching on the ecology of the ocean including how there are actually different habitats out there, and how you can use all of this information to have a more fun exploration of seabirds when you next go out on a boat to see our great Pacific Ocean. Alvaro Jaramillo, owner of Alvaro’s Adventures, was born in Chile but began birding in Toronto, where he lived as a youth. He was trained in ecology and evolution with a particular interest in bird behavior. Research forays and backpacking trips introduced Alvaro to the riches of the Neotropics, where he has traveled extensively. 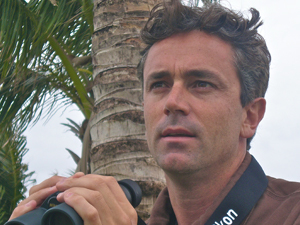 He is the author of the Birds of Chile, an authoritative yet portable field guide to Chile’s birds. Alvaro writes the Identify Yourself column in Bird Watcher’s Digest. Alvaro recently wrote part of the sparrow chapter for the Handbook of Birds of the World, and the new ABA Field Guide Birds of California. He was recently granted the Eisenmann Medal by the Linnaean Society of New York, it is awarded occasionally for excellence in ornithology and encouragement of the amateur. 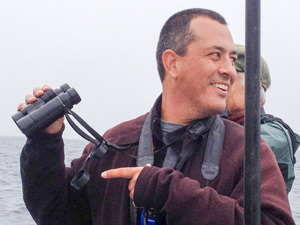 He organizes and leads international birding tours, as well as a full schedule of pelagic trips out of Morro Bay, Monterey, Bodega Bay and Half Moon Bay. Alvaro lives with his family in Half Moon Bay, California.